Making accurate predictions about the economy has always been difficult, as F. A. Hayek noted when accepting his Nobel Prize in economics, but today forecasters have to contend with increasing complexity and unpredictable feedback loops. In this accessible and engaging guide, David Hendry, Michael Clements, and Jennifer Castle provide a concise and highly intuitive overview of the process and problems of forecasting. They explain forecasting concepts including how to evaluate forecasts, how to respond to forecast failures, and the challenges of forecasting accurately in a rapidly changing world. Topics covered include: What is a forecast? How are forecasts judged? And how can forecast failure be avoided? Concepts are illustrated using real-world examples including financial crises, the uncertainty of Brexit, and the Federal Reserve’s record on forecasting. 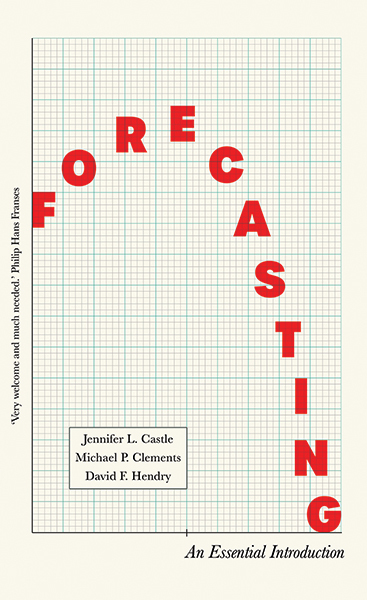 This is an ideal introduction for university students studying forecasting, practitioners new to the field and for general readers interested in how economists forecast. David Hendry is professor of economics, Oxford University and director of economic modelling, Institute for New Economic Thinking. Michael Clements is professor of econometrics, Henley Business School. Jennifer Castle is tutorial fellow, Oxford University and research fellow at Institute for New Economic Thinking.